You are here: Home » Is Homo habilis enjoying his lunch? 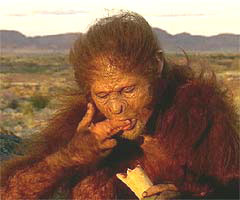 Is Homo habilis enjoying his lunch? Last post, I lamented the fact that I spend most of my lunch looking forward to the next bite (and not tasting the present one). I blamed this habit on the role of dopamine in the ventral striatum: to anticipate rewards, work toward them, and focus attention on what’s next. Here’s a picture (a reconstruction, obviously, as cell phones lacked camera functions in those days) of Homo habilis having lunch. H. habilis lived about 2 million years ago, and is thought to be the first member of the Homo genus. In other words, he’s our direct ancestor, and no doubt our brains resemble his in many ways. Well, we have bigger frontal lobes. But…so what? How often do we use them to advantage while eating lunch? I use my frontal lobes to read the newspaper while having lunch, which is an elaborate way to avoid any contact with the taste of my food. What does any of this have to do with the psychobiology of addiction? Goal anticipation equals craving when the goal is out of reach. This is a common state for addicts, even for recovering addicts. When the goal (let’s say more ribs) is in reach, then the dopamine surge simply directs you take more. The theory I follow for understanding the addicted brain divides motivated behaviour and pleasure into two distinct functions: wanting and liking. This theory has been proposed and defended by Berridge and his colleagues for over 10 years, and as far as I can see, it beats other theories hands-down. 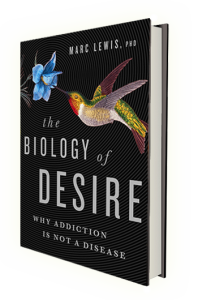 According to Berridge, wanting is subserved by striatal dopamine, and liking is subserved by…you guessed it…opioids. I cover all this in detail in my book, but the thumbnail version is this: When you like something (and get a rush of endogenous opioids), it is adaptively important to get more of it. That requires wanting. Opioids make you feel good, but they also increase dopamine flow to the ventral striatum (from the VTA, ventral tegmental area, in the midbrain). So dopamine takes over from opioids, by which means wanting takes over from liking. Your brain lurches into gear: where will I find more? how will I get it? I can’t wait! The symptoms of craving are obvious. Our ancestor, whose mesolimbic dopamine system was pretty much exactly the same as ours, looks to me as if he’s saying: “Hmmm, not bad, tastes pretty good. Where can I get more…?” He’s just at the shift point from liking to wanting. Look at the creases in his brow. I’ll bet you he’s already thinking about the next bite. It would be interesting to see you expand on this in more detail as it pertains to various foods and macronutrients. For example, there is proof that ‘liking’ and ‘wanting’ can be dissociated when it comes to eating behaviors. A sucrose solution increases ‘wanting’ more than ‘liking’, and vice versa for lipids – at least in rats. That might help to explain the success some people has had with low carb/low sugar diet. Not because of some metabolic trick, but for the simple reason that they do not crave (‘want’) as much food as they do on a high(er) sugar diet. A low carb/high fat diet would still be ‘liked’ but not cause similar cravings, which would help with diet compliance – you still enjoy the diet (dietary fat is highly ‘liked’), but do not overeat on it (dietary fat is lower on ‘wanting’). This is fascinating. Can you give me a reference for the sucrose/lipid reversal of liking and wanting? I know that some cells in the orbitofrontal cortex fire more rapidly to sugar, while others fire more rapidly to the creamy texture that must apply to fats/lipids. But I don’t see any reason why one should be liked more and the other wanted more. Point me in the right direction, please. IMO a key point is that food concentrates are VERY rare in the State of Nature. There are very few fats in vegetables other than olives and avocados. Most wild animals as in Africa are incredibly lean with very low fat content as they are almost always on the edge of starvation and in flight. There ARE exceptions like Salmon and Oolicans but they are rare except in certain places. Most carbos are stored as cellulose, silcates, starches and so forth. Like night color vision for which there is no evolutionary requirement developing resistance to some substance you would likely never have encounter would not be indicated other than by chance. Fruits have a lot of free sugars when ripe if they are available but there is virtually no sugar at all in an animal other than glycogen or you could drink the blood I guess. Mongols drank horse blood and domesticated animals can be milked for lactase which is a marginal sugar. Point: sugars and fats were essential but rare in nature so there is a dopamine premium to obtain them to scheme to secure them. With industry we have unlimited sugars and fats with an unlimited appetite for them. On the West Coast here Coastal Natives harvested fish grease and packed it by trail + on foot all the way into Alberta to trade with Plains Indians. It was that valuable. All this is good enough reason to have both sugar and fat as “primary reinforcers”. They are tremendously valuable. Recently I mentioned that cortical (orbitofrontal) cells have built in responses to both sweetness and creaminess, and that’s saying a lot. The brain is not as big as we like to think, and something has to be really special to get built into the primary architecture. Otherwise, reinforcement value is left to learning, which means anything can be written or overwritten on the synaptic networks. Carbon life has to eat carbon (hydrocarbons, sugars, fats, etc), so I guess it’s no accident that we love ice cream (which is both sweet and creamy). “The brain is not as BIG as we like to think” ooooh, didn’t think about that….maybe it is overrated by a considerable margin!?! I am accepting the division between liking and wanting as a good account of addiction until it can be fully refuted other than by anomalous tedia. Formerly I was limited to considering human intelligence in the context of Humans and the other two forms of the Chimpanzee. When I learned that key neurotransmitters like Dopamine and Serotonin are 100s of millions of years old I realized that “intelligence” has actually been evolving on the Earth for about a billion years! This evolution of intelligence and the capacity to hold some sort of knowledge has been spread over an enormous number of species 99.8% of which are already extinct. So Chimpanzees possess a range of approaches to this evolution. Since almost all of our brain is incredibly ancient and entirely cobbled together with existing molecules and genetic assembly instructions it is incredibly vulnerable to being hacked even if the hack is not a perfect match. Too many entranceways have been left in place because life in the natural state made it very improbable that you would find dopamine concentrates lying around. Our human neurotransmitters ARE out there lying around but in very diffused forms. Coca leaf can generate a reasonable supply of Dopamine substitute. If you concentrate this as Cocaine you have a substance so powerful it will disrupt the healthy neurotransmitter feedback/balanced state. All “normal” behavior can be bypassed successfully if Cocaine is available. Methamphetamine works about as good or good enough. It turns out that the sap of the Poppy used by that species for some other purpose than getting “high” is a good enough match for the opioid circuitry that is utilized in the brain reward circuitry. Once this general idea was realized we could pillage all the flora and fauna for all kinds of useful hacks that alteres our brain chemistry in a desired direction. The essential step was to identify the presence of a useful compound then CONCENTRATE it through domestication, selection and then chemical concentration. This has been done with the Poppy for 1000s of years as we know from ancient books but I wonder how strong the precursor plant was for opioids. We might have an entirely different picture on opium addiction if people had to eat 100 pounds of poppy heads to get stoned. Since you have pointed out that the addiction denial mechanisms are subject to exhaustion it seems that in most if not all cases the patient will revert to addiction IF the substance is obtainable. Since these are chemicals essential for our functioning and not artificial other than in terms of their degree of refinement and purification it appears that access to these compounds must be denied other than in extreme medical emergencies or in the terminally ill in which no further social function can be anticipated. How am I doing here, Professor? Very well, Mike. I think the idea that the brain is “incredibly vulnerable to being hacked” is spot on. In fact, I’m making it the topic of my next post. Thanks! The issue of access is a bit more complicated. I’ll get back to that later. Looking forward to more on the issue of access! Fascinating post and comment thread here. I’m relating to what Carolyn says below about always feeling the other conversation is more interesting, and the rest of it too. I’d forgotten about how opioids increase dopamine while you’re still eating (or drinking or shooting up or whatever). This explains a phenomenon I’ve always found weird: I’d be sitting there with a glass of wine still half-full but already thinking it’s not enough, I’ll be needing more more more. And it’s not just with wine. It’s certainly with food too — usually stuff like, yes, ribs, wings, chips — generally high-fat things and proteins, but interestingly, not so much with, say, cereal. Yes, the opioid-dopamine connection explains a lot about how we move from liking something to wanting more. It’s as though someone designed this machine with the best logic and optimal materials, but it turned out to have serious bugs once it got released into the world. Chicken wings drive me into a frenzy of wanting! I have found your last two blogs fascinating. I enjoyed the imagery and the anticipation of the next delicious bite of ribs, while at the same time I can see how dopamine plays a role in so many aspects of my life. The way I see it dopamine is what always makes me feel the need to be doing something more than I am doing currently. It creates the excitement toward doing something new or better next time. I would imagine that the people who harness this feeling are very successful. Along these lines dopamine would also create the feeling that the grass is always greener on the other side. When writing an essay I begin to feel excited as I gather the information, this would be the liking or the opioids. Then when I create the opening statement I feel like it is off to the races until I finish the essay, which would be the wanting or the dopamine. When I bake cookies I am thinking of how to improve the next batch before the current batch is out of the oven. I also find that when I am at parties or social gatherings I always feel that the other conversations are more annimated or interesting than the one I am involved in. Although I would like to enjoy the moment, I wonder if it is the dopamine that allows me to feel positive and keep looking forward. Hi Carolyn. There is certainly a bright side to looking ahead, not only in evolution but in our day-to-day lives. You sound like you ARE one of the people who harness the feeling of “what’s next” with a specific eye to improvement. I’d like to taste that next batch of cookies. The sense that the grass is greener on the other side has to do with the relation between dopamine and the certainty of goal attainment. When the goal is easily within reach, i.e., certain, then striatal dopamine goes down. If the goal is more distant, less certain, then it goes up. Dopamine is useful for getting from here to there, but it’s not necessary for staying where you are. And the notion that the grass is greener on the other side is largely responsible for novelty, improvement, achievement, and of course survival, which (in the old days) depended on all of the above. So, I shouldn’t get down on dopamine. But see the comment above for a look at its darker side. Some of the talk re food addiction has made me think besides fat and sugar (which are the usual suspects!) what about MSG (or even its “healthy” alternative yeast, which I’ve noted has replaced the former in a lot of crisps)? I know for me just the thought of cheese-flavored corn chips gets me salivating like Pavlov’s dog! And I know that one crisp is never enough so I’m just wondering if the MSG (besides the fat, salt or sugar content) is contributing to the “wanting” (let alone the) “liking” of what I’m eating? Or it’s primarily the fat and sugar that’s at fault? I’ve wondered about that too. Monosodium glutamate…includes “glutamate”….which is THE major neurotransmitter for just about everything to do with goal orientation…essentially “wanting” I guess, more than liking. Which is probably why you can’t have just one crisp.